Diesel buses – and the choking smog they spew – are a common sight in most cities. But not in Shenzhen, China. The southeastern city, which connects Hong Kong to mainland China, announced at the end of last year that all of its 16,359 buses had gone electric. The city’s buses are the world’s first 100 percent electrified bus fleet, and its largest – bigger than New York’s, Los Angeles’s, New Jersey’s, Chicago’s and Toronto’s electric bus fleets combined. How the city overcame obstacles like high costs, lack of charging station infrastructure and more provides lessons for other cities looking to electrify their bus lines. Diesel buses may comprise a small percentage of the vehicles on city roads, but they create an outsized environmental impact. 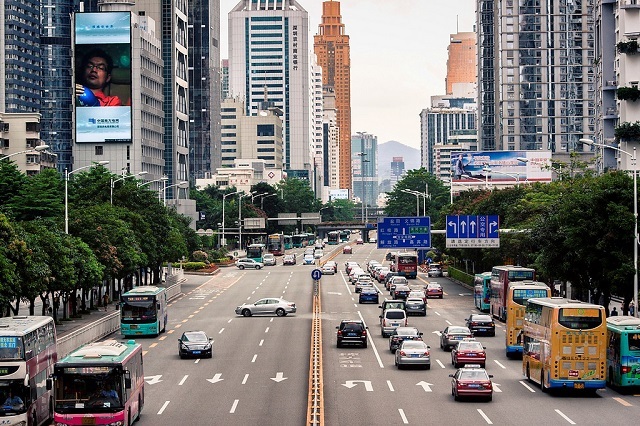 In Shenzhen, diesel buses represent 0.5 percent of a city’s total vehicle fleet, but account for 20 percent of its transport emissions because they operate longer and drive more miles than private cars. Switching to electric buses thus offers a vital path towards clean air. Cities and states around the world, such as London and California, are pursuing e-buses as a way to meet their air quality goals. Yet shifting from diesel to e-buses isn’t easy. Electric buses cost two to four times* more upfront than conventional diesel buses. They need the infrastructure to support consistent charging. And their batteries need to be replaced at least once during their lifetime, which can be costly. Battery replacement is nearly half of a vehicle’s price. For Shenzhen and many Chinese cities, policy incentives such as national and local subsidies play a major role in closing the cost gap between e-buses and conventional diesel buses. Before 2016, a 12-meter e-bus in Shenzhen received a $150,000 government subsidy, more than half of the vehicle’s price. Yet some studies show that subsidies may not be necessary to make e-buses cost-competitive with diesel buses. 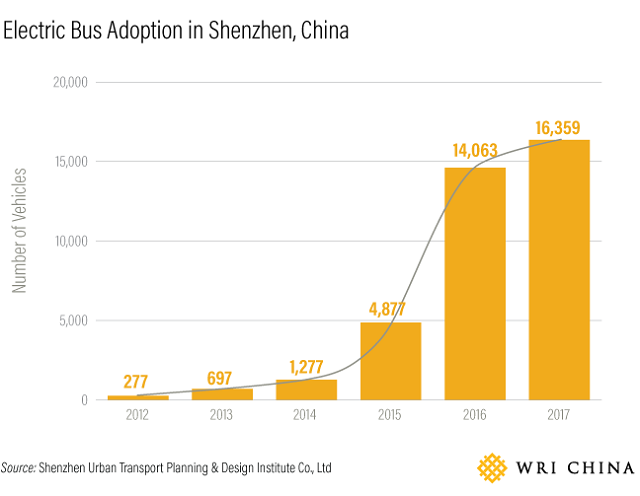 According to a study conducted by the World Bank and Global Environment Facility, the lifecycle cost** of e-buses in Shenzhen as of 2016 (including procurement, energy and maintenance costs over an eight-year period) is $375,457, almost the same as a diesel bus’s lifetime cost of $342,855. In short, while e-buses in Shenzhen have a high upfront cost, their operation and maintenance costs are significantly lower than those of diesel buses. Instead of directly procuring e-buses at the subsidized prices (around $90,000-$120,000) like many other Chinese cities, some bus operators in Shenzhen lease vehicles from manufacturers. This greatly saved operators’ upfront investments, and reduced the need for debt financing. Operating an e-bus fleet differs significantly from operating a diesel fleet. Due to shorter driving ranges and recharging needs, Chinese cities typically require 100 percent more e-buses than conventional diesel buses. This requires additional money for procurement, operations and maintenance. Shenzhen almost entirely wiped out these additional costs by optimizing its operations and charging. Shenzhen adopted a type of e-bus where a five-hour charge supports 250 kilometers (155 miles) of driving, almost sustaining a full day of operation. However, to ensure recharging does not disrupt service, bus operators collaborated with charging infrastructure providers to furnish most of the bus routes with charging facilities. Currently, the ratio of charging outlets to the number of e-buses is 1:3. The charging facilities are also open to private cars, thereby improving the financial performance of the charging infrastructure. The bus operators also coordinated the time of charging with the operation schedule, with all e-buses charged fully overnight when electricity prices are low, and recharged at terminals during off-peak travel times. The early-phase technological immaturity of e-buses, coupled with the mid-life battery replacement need, often lead to frequent mechanical breakdowns and increased costs. Bus operators traditionally shoulder all these costs, but in Shenzhen, bus manufacturers provide a lifetime warranty for vehicles and batteries, because the bus operators required this at the procurement stage. Manufacturers are better positioned than bus operators to manage financial risks because they can continuously innovate battery technologies. Shenzhen’s experience proves that it’s possible for cities to cost-effectively electrify their bus fleets. The result benefits citizens both on and off the bus: Shenzhen met its air quality improvement goals in both 2016 and 2017. **The lifecycle cost refers to providing the same level of service (including mileage and frequencies) as a diesel bus, the number of e-buses and the pertinent investments (including procurement and O&M) required. Lu Lu is a Research Analyst for the Transport Program at WRI China. Lulu Xue is a Research Associate at WRI China. Weimin Zhou is a Transport Specialist with the World Bank. The People of Bogotá Want Cleaner Air. Will the City Listen?